| Clear Expectations | responsibility and needs in each division to accomplish the tasks required." Lewis advocates updating job descriptions whenever new regulations come into play or a practice changes, whether through new staff members or reorganization of management. She also recommends having every employee and the practice operator sign off on them. The task of creating job descriptions for every employee can be daunting. To help practices get started, medical societies and professional associations often offer templates that can be customized to a practice's individual needs. (See "Resources" on page 27.) Practice management consultants can also help practices develop these materials. Typically, these professionals will make an on-site visit to observe the practice at work and then help the managers develop written job descriptions and protocols, says Shorr. Developing Protocols When it comes to documenting protocols for practice operations and procedures, no detail is too small. "You need to write it down," Shorr says. "You need a protocol that says if a lens on a goggle gets broken, it gets thrown away. It doesn't get glued back on." In one case, he developed a protocol for a 28 Surgical Aesthetics ❘ January/February 2014 "Without protocols, there is no way to train people or counsel them on how to improve." "It is important for the doctor to get involved at some point in the process," says Dr. Taub. "If things start to go amiss, and you don't know what's happening in your own practice—you will have problems." Conversely, when physicians and their practice management teams are able to clearly communicate each job function and provide protocols to help employees achieve their objectives, practices can devote more of their time to delivering topnotch patient care and developing new strategies for continued success. ❖ Annemarie Mannion is a Chicago-based freelance writer. © ISTOCKPHOTO.COM Job descriptions help practices in the hiring process by pinpointing the skills and expertise required for the position. practice that was consistently being hampered when oxygen tanks ran low. It speciﬁed that tanks needed to be reﬁlled whenever they reached a certain psi, and assigned the responsibility of monitoring and having the tanks reﬁlled to one speciﬁc employee. When it comes to patient care, Dr. Taub notes that having written protocols creates consistency in both delivery and outcomes. They also make training easier. 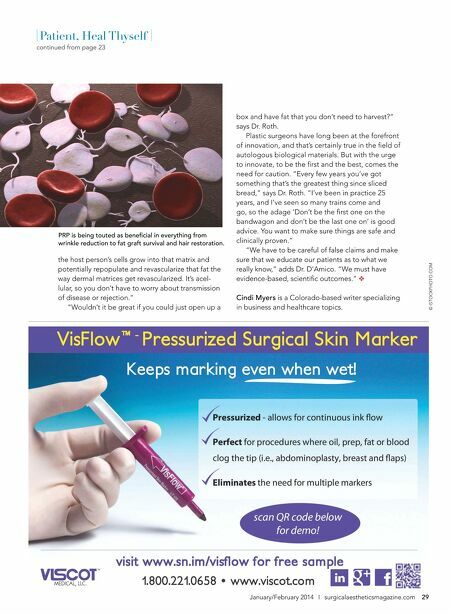 "Without protocols, there is no way to train people or counsel them on how to improve," says Dr. Schlessinger. But, creating protocols is only the ﬁrst step. 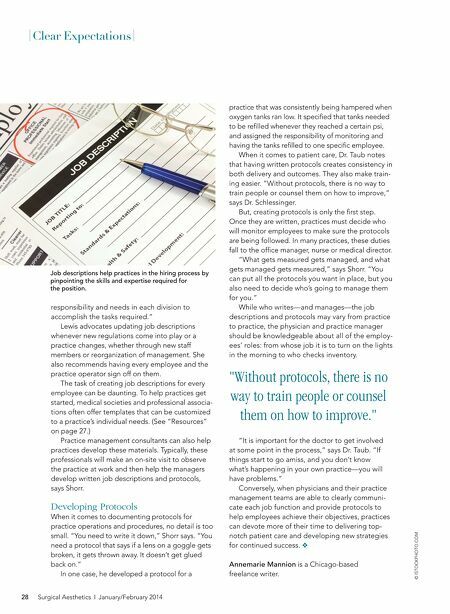 Once they are written, practices must decide who will monitor employees to make sure the protocols are being followed. In many practices, these duties fall to the ofﬁce manager, nurse or medical director. "What gets measured gets managed, and what gets managed gets measured," says Shorr. "You can put all the protocols you want in place, but you also need to decide who's going to manage them for you." While who writes—and manages—the job descriptions and protocols may vary from practice to practice, the physician and practice manager should be knowledgeable about all of the employees' roles: from whose job it is to turn on the lights in the morning to who checks inventory.